Toploading balances are used primarily for weighing solid material when an accuracy of 0.1 g is satisfactory. 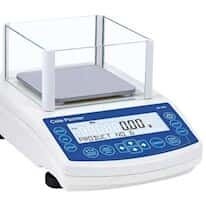 Our range in laboratory balances and industrial scales includes a variety of features to suit your application needs. Models are available with internal or external calibration, built in RS-232 to allow connectivity to computers or printers, and stability filters to compensate from vibrations, drafts, or temperature changes. When selecting your scale know the readability, look at capacity, consider the size and shape of the weighing platform, and computer compatibility.